My mother read me Robert McCloskey’s “Blueberries for Sal” when I was little. The towheaded, tomboyish Sal, prone to pursuing her own fancies, might have been me. Remember the enchantment of books when you were small, when the veil between life and pretending was porous? For me, “Blueberries for Sal” scintillated like a dream: resonant, lived-in, true. A child’s imagination stretches open, inviting illustrations and story to flow in and play, and help shape her sense of herself and the world. McCloskey, best known in these parts for another favorite book, is the subject of “Make Way for Ducklings: The Art of Robert McCloskey,” a buoyant exhibition at the Museum of Fine Arts through June 18. The show was organized by the Eric Carle Museum of Picture Book Art, in Amherst. It comes at the same time as “KAHBAHBLOOOM: The Art and Storytelling of Ed Emberley” at the Worcester Art Museum through April 9. Both shows lure kids and grown-ups alike with familiar, vibrant art and chances to read and draw. Emberley’s first book came out in 1961, and since then he has illustrated more than 80, many of which he authored. McCloskey, who died in 2003, wrote and illustrated eight books between 1940 and 1963; he illustrated several other books, but the MFA show concentrates on the ones he wrote. 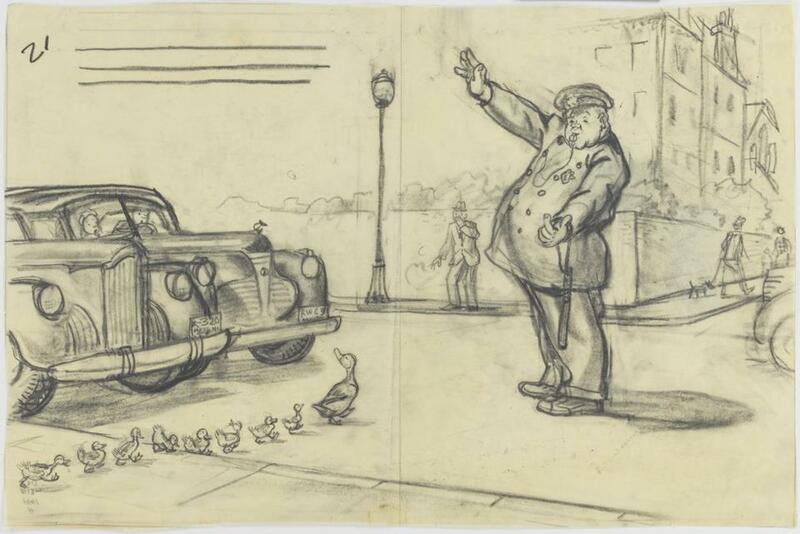 If you’re among the few who don’t know, “Make Way for Ducklings,” published in 1941, follows the story of a family of ducks trekking through downtown Boston. It was McCloskey’s second book. It won a Caldecott Medal — the Oscar for children’s book illustrators — and in the 1980s, inspired sculptor Nancy Schön’s beloved bronze tribute to the ducklings in the Public Garden. Like many young artists, McCloskey started out rough. He’d attempted to make a career for himself as a painter, but couldn’t sell enough canvases to make a living. A handful of his paintings on view suggest he was skilled, but not visionary. Next to his effervescent illustrations, they look constricted and dour. Children’s book editor May Massee, the aunt of an old classmate of McCloskey’s, advised him to illustrate what he knew. His first book, “Lentil,” told the story of a scamp in an Ohio town modeled after the one where McCloskey grew up. All the works here, from preliminary sketches to final illustrations, show off McCloskey’s high-spirited sense of story and line. The calligraphic sweep of his lines make his drawings look loose and easy, but they were painstakingly composed and based on intent research. For “Ducklings,” in what could have been the makings of a completely different book, he brought 16 ducks to live with him in his small Greenwich Village apartment. McCloskey proposed to illustrate “Ducklings” in watercolor, but Massee, now his editor, nixed the idea; colored ink was too pricey. You’d think color would light up the page, but strangely, in this book it doesn’t. Other than one riotous image depicting a windstorm, the illustrations on view here are by and large stolid; they miss the jaunty velocity of McCloskey’s uncolored drawings and prints. But then came his last book — “Burt Dow, Deep-Water Man,” a Jonah-style story about a Maine fisherman who sails into a whale’s mouth. Here color and line enter an exuberant duet. McCloskey has a moment of comic inspiration — and luminous art — when Burt sees his way out of his dilemma. To expel himself, he splatters paint on the walls of the whale’s stomach, á la Jackson Pollock. Brilliant. Emberley, from Ipswich, is known for his popular “Drawing Books” series with simple instructions for how to draw animals, faces, and plenty more. His illustrations and McCloskey’s are the work of two different generations — McCloskey’s books have benign, Norman Rockwell-like story lines, compositions, and humor. Emberley is more a product of the 1960s — restlessly experimental in style and technique and, on occasion, gently subversive in content. He often crowds the page with looping, intricate designs, an approach that I suspect inspired artist Caleb Neelon, the guest curator, when he was a boy. In 1963, for “The Story of Paul Bunyan,” Emberley carved a giant woodblock depicting the lumberjack. He and his wife, Barbara, made just two prints, using spoons to mash the paper into the inked blocks, too big to run through a press. The couple and their daughter, Rebecca, made a third print for this show: Bunyan’s a magnificent and bristly fellow, with a checkerboard shirt pulsing over his enormous arms and a manic grin. Emberley, too, is a Caldecott Medal-winner, for “Drummer Hoff,” adapted by Barbara from a Mother Goose rhyme. It came out in 1967, and tells the story, in psychedelic filigrees, of soldiers building a cannon and a drummer firing it. On the last page, the cannon sits peaceful among wildflowers. It’s been suggested that “Drummer Hoff” was a veiled critique of the Vietnam War, although the Emberleys remain mum on the subject. Both exhibitions go into informative detail about the artists’ technical feats and avid devotion to craft, but we all know what a kid looks for in a children’s book: wit, compassion, and a story and illustrations that will envelop them in a magical world. McCloskey did that in his books. Emberley still does.